Climate change or climate variability has been predicted to have significant impacts on global and regional productivity of agricultural crops, food and nutrition security and livelihoods. In Sub Saharan Africa in particular, the performance of agricultural crops is predicted as highly susceptible to variabilities in climate and weather. The records of crop yields in Nigeria from 1961-2013 and some climatic variables (rainfall and temperature) were obtained while trends were analysed, and correlation and regression relations between yields and climate parameters conducted. The trends of changes in the yield per land area (hectare), area harvested and total yearly production was determined to accertain year to year variations for the period of study. The crops were selected because they constitute priority staple food and cash commodities under the nation’s Agricultural Transformation Agenda (ATA) action plan. Crop yields and climate variables differed markedly from year to year, in particular, decadal trends in temperature and rainfall varied widely across the period of study. Between 1962 and 2013, the yield per land area (hectare), area harvested and total yearly production had increased while yield per land area had not. There had been tremendous increases in the area harvested and total yearly production for pulses (cowpea and soybean), cereals (maize, rice and sorghum) and roots and tubers (cassava and yam). The results showed that the periods when the lowest and highest yields were obtained differed among species selected for study. The highest (43.50 kg/ha) and lowest (1.085kg/ha) yields for cassava were observed in 1999 and 2001, respectively, while both highest and lowest yields for sorghum were recorded in 2012.The yield change may be attributed to changes in climate and weather patterns while the coefficients of the regression models may help crop yield change forecasting. Crop productivity was particularly vulnerable to climate change and that weather factors in particular, rainfall and temperature varaibilities have significant effects on the yield of the crops in Nigeria. Climate change is one of the greatest challenges of the 21st century and agriculture is particularly vulnerable to climate change [1,2] because of its dependence on natural weather patterns and climate cycles for productivity. The impacts of climate change on agriculture are both direct and indirect. Important direct effects will be through changes in temperatures, precipitation and radiation, more frequent extreme weather (like droughts, floods, and wind storms), atmospheric carbon dioxide concentration [1,3], length of growing season and modifying evaporation, runoff, and finally soil moisture . Indirect effects will include potentially deterministic changes in diseases, pests, weeds, and sea level rise, the effects of which have not yet been quantified in most studies. These weather variables can change yield and agricultural productivity [3,5]. Although there will be gains in some crops in some regions of the world, the overall impacts of climate change on agriculture are as negative, threatening global food security [5,6]. Predictions show that global agricultural productivity would fall by 15.9% in the 2080s if global warming continues unabated [1,7] and developing countries lying in the tropical and sub-tropical regions would face catastrophic result. Literature reports that extreme weather events and climatic anomalies negatively affect crop yields. Climate change is a serious threat to crop productivity in SSA that is already food insecure. For Africa, most of the evidence reviewed projected a yield reduction of up to 40%, across all crop types and sub-regions simulations of our meta-analysis, 33.7% and 23.4% of C3 and C4 simulations showed a positive change in yield to climate change, and 66.3% and 76.6% showed a negative change, respectively . Across Africa, reports show that the projected mean change in yield of all crops is 8% by the 2050s in both regions. Rice, sugarcane and yams account for only 6 of 162 observations for Africa despite the fact that these crops collectively account for 27% of the total cropped area in Africa . The estimated mean yield change for West Africa (12.5%) correlates closely with a median yield loss of 11% reported by other research based on data from 16 published studies . Given global concerns regarding the vulnerability of certain staple crops in some regions to climate change and the need to adopt better evidence-based approaches to inform policies . The impact of climate change on crop yield is generally estimated from a combination of biophysical crop growth models and climate models, a process which itself is prone to error by the simplification of real-world complexity . In Nigeria, agriculture is the second largest sector of the economy, after the oil and service industry, accounting for about 26 of GDP and 26% of non-oil exports. It also provides nearly 23% of the total country’s employment. Inadequate empirical evidence exists on crop yield response to the alterations in climatic conditions and weather-based disasters affecting crop yields in sub-Sahara Africa. In particular, there has been few studies which assessed yearly (seasonal) fluctuations in crop yields and the effects of extreme weather (temperature and/or precipitation) on crop yields in Nigerian [8,12]. Despite international negotiations to reduce greenhouse emissions, the changes in global climate system means that we are already committed to a world that will be, on average, 0.6 oC warmer by the end of the century, with associated changes in rainfall patterns. The projected spatial and temporal changes in precipitation and temperature will shift current agro-ecological zones  and have major impacts on the viability of both dry land subsistence  and irrigated crop production. As climate is a primary determinant of agricultural productivity, any changes will influence crop growth and yield, hydrologic balances, supplies of inputs and other components of managing agricultural systems. Several studies had been conducted to explain the relationships between crop yield and climate and climate-crop yield forecasts [8,15]. Time series data have been used to assess yearly and seasonal fluctuations in crop yields and the influence of weather. The methods commonly employed include the use of calibrated crop-models, regression methods and the generalized additive model which analyze past climatic trends and their effects on rainfed crop yields . It has been reported that the yields of rainfed crops would decrease in humid tropics primarily because of variability in the onset, cessation dates and decreasing amount of precipitation and higher temperature under the climate change scenarios. The results from these studies have shown that precipitation and temperature are essential for crop yield and that extreme weather had caused poor harvests of agricultural crops . Advances in short term and seasonal weather forecasting had been made, as well as in long term climate modelling, and are available for early warnings and advisories. These have caused an increasing emphasis on management of the risk to agriculture from extreme weather events and anomalies in climate conditions. Literature reports show that climate change is global; likewise its impacts; but the most adverse effects will be felt mainly by developing countries . Major gaps in climate impact knowledge still exist for particular crops and regions, despite the apparent large evidence base within the scientific literature . The objectives of this study are to characterize the yield of some crops over a period spanning 1962 to 2013 and the decadal trends of rainfall, maximum and minimum temperatures from 1986-2015. The trends in crop productivity and climate parameters were related using correlation and regression analysis over the study periods. A consortium of time series of Nigerian national average crop yields in addition to fine-scale weather data set that included distribution of precipitation (rainfall) and temperature between the minimum and maximum from 1960 to 2013. Secondary historical weather data were obtained from the West African Science Service Centre on Climate Change and Adapted Land Use (WASCAL), FUT, Akure, Nigeria, NIMET, NASA and FAO and subjected to analysis of decadal mean for temperature and rainfall. In this study, records of crop yields from 1961-2013 in Nigeria and some climatic variables (rainfall and temperature) between 1986 - 2015 were analysed, and correlation and regression relations between were conducted to relate rainfall and temperature trends with the productivity of the selected crops. The secondary and historical data on agriculture and Weather were obtained from National Aeronautic Space Administration (NASA), West Africa Climate Graduate Research Project (WASCAL-GRP), Meteorological Observation Station, Federal University of Technology Akure (FUTA), Food and Agriculture Organization (FAO) statistics, FAO Agricultural production covering the period between 1986-2015. The selected crops for this work are okra, maize, rice, yam, vegetable, cocoa, oil palm etc. Data were subjected to statistical analysis mainly of Mean, Standard Deviation (SD), Standard Error, Decadal Averages, Yearly mean. Correlation and regression analysis was used to establish the relationship between yields of some crops that is, maize, rice, palm oil, vegetables, yam, onion, cocoa and some weather factors (mean and maximum temperature and cumulative seasonal/annual rainfall, GDD). Cocoa, citrus, oil palm, rice, maize, sorghum, cowpea, g nut, soybean, vegetables the main software used is EXCEL for the data processing and data analysis. Time series (year: 1970 – 2013) of a normalized annual departure of rainfall (standised mean rainfall anomaly) for two diverse agro ecological zones (rainforest and savanna ecologies) of Nigeria, is presented in Figure 1 a, b. The anomaly values (standard deviation/anomaly, δ) of +5 is taken as moderate fluctuation while negative values (– 0.5δ) of anomaly denote drought years, and above + 0.5 as likelihood of flood events. In the rainforest ecology, there is no clear and definite trend in rainfall pattern (Figure 1a) and the savanna ecozones were characterised by declining trends (Figure 1b). An illustration of climate change in Nigeria (maximum and minimum temperatures for years 1970 - 2013) are presented in Figure 2 a, b. This illustrates elevated temperatures characterized by high maxima and minisma values. This illustrates elevated temperatures characterized by high maxima and minima values. There is high probability of exceeding crop-specific high temperature thresholds and limiting soil water status . These stress factors may elicit adjustment of plant physiology and water use. Such plasticity is important to acclimation to environmental stresses. Figure 1: Rainfall anomaly (a) Rainfall anomaly (variability scenario): Rainforest zone (1970 - 2015) (b) Rainfall anomaly: (variability scenario): Savanna zone (1970 - 2015). Figure 2: Temperature anomaly (a) Maximum temperature anomaly: rainforest zone (1970 - 2015) (b) Minimum temperature anomaly: rainforest zone (1970 - 2015). The plot of decadal trends in solar radiation minimum, maximum and average temperatures showed differences in magnitude within and among decades (Figure 3). There are evidences of increasing values of minimum, maximum and average temperatures. The trends in decadal pattern of rainfall and air humidity showed that while decadal values of rainfall decreased, increasing trends in values of relative humidity is observable. The decadal trends of temperature and rainfall would have implications for water resources in terms of recharge of soil, streams, rivers and other water bodies in the ground water aquifer also, the magnitude of evaporation soil and water bodies and transpiration from vegetation (hydrologic cycle). These changes in ecosystem processes and functions would have consequences on growth and yields of agricultural crops. Figure 3: Plot of decadal trends (a) Decadal trends of solar radiation intensity (1986-2015) (b) Decadal trends of minimum temperatures (1986-2015) (c) Trends of decadal maximum temperatures over Nigeria (1986-2015) (d) Trends of decadal mean temperatures over Nigeria (1986-2015) (e) Trends of decadal rainfall over Nigeria (1986-2015) (f) Trends of decadal relative humidity over Nigeria (1986-2015). The time series of area harvested, production level and yields of the selected crops over a period of 52 years (1960-2012) are presented in Figure 4. There were high year to year variabilities in yields of the selected crops. The results showed that the time when the lowest and highest yields were obtained differed by crops. In general, between 1962 and 2013, the yield per land area, area harvested and total yearly production had increased for the various crops studied. There had been tremendous increases in the area harvested and total yearly production for pulses (cowpea and soybean), cereals (maize, rice and sorghum) and roots and tubers (cassava and yam). The yields of cereals maize and paddy rice fluctuated over years 1986-2013, the lowest reductions were obtained between 1990 to 2010. However in the case of rice sharp drop in yields were obtained from 1988 to the lowest in 2007 and the highest yields were obtained between 2008 and 2013. The yields of pulses also fluctuated over years 1986-2013, the lowest reductions were obtained between 1990 to 2010. The highest (43.50 kg/ha) and lowest (1.085kg/ha) yields for pulses (cowpea, soybean) were observed in 1999 and 2001, respectively. However in the case of rice sharp drop in yields were obtained from 1988 to the lowest in 2007 and the highest yields were obtained between 2008 and 2013. The highest yields of vegetable were highest for year 2008 and 2011 while the lowest yields was 1986 followed by increasing trends up 2008 while the highest yields of roots and tubers was obtained between 2010 while 1986 marked the lowest yields. The highest (43.50 kg/ha) and lowest (1.085kg/ha) yields for cassava were observed in 1999 and 2001, respectively, while both highest and lowest yields for sorghum were recorded in 2012. The highest yields of cocoa, citrus and oil palm and plantain were observed at around 1987-1992 while the lowest yield was observed from 2007 to 2009 respectively. The highest (43.50 kg/ha) and lowest (1.085kg/ ha) yields for cash crops (cocoa, citrus, oil palm and plantain) were observed in 1999 and 2001, respectively, while both highest and lowest yields for sorghum were recorded in 2012. Figure 4: Trends of changes in crops area harvested, production level and yields (1960-2013) in Nigeria. Relationships between some weather factors (rainfall, maximum temperature) and yields of some crops (Figure 5). 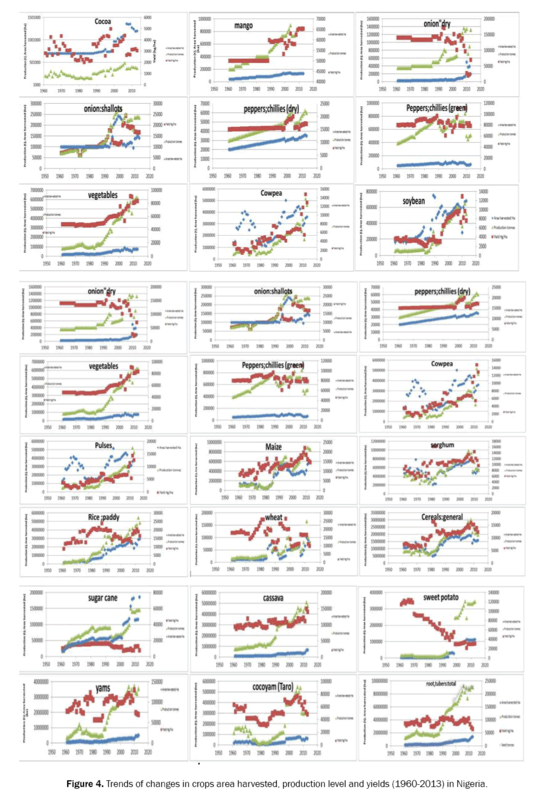 The summary of the results of the correlation and regression analysis between weather factors of rainfall and maximum temperature and yields of crops studied over the periods between 1986 and 2012 (Table 1, 2). In most cases, negative correlations were obtained between rainfall and crop yields, the wide scattered between rainfall and yields over the time span resulted in very weak relationships. The R2 values were very low ranges up between 0.01 and 0.10. The correlation and regression analysis between mean temperatures and crop yields showed that the correlations were both positive and negative and the regression equations depicting the trend line were best described by polynomial equations. Figure 5: Relationships between some weather factors (rainfall, maximum temperature) and yields of some crops (a) Relationship between rainfall and plantain yield over a period of 1986-2012 (b) Relationship between temperature and plantain yield over a period of 1986-2012 (c) Relationship between rainfall and yam yield over a period of 1986-2012 (d) Relationship between temperature and yam yield over a period of 1986-2012 (e) Relationship between rainfall and cocoa yield over a period of 1986-2012 (f) Relationship between temperature and cocoa yield over a period of 1986-2012 (g) Relationship between rainfall and cassava yield over a period of 1986-2012 (h) Relationship between temperature and cassava yield over a period of 1986-2012 (i) Relationship between rainfall and vegetable yield over a period of 1986-2012 (j) Relationship between temperature and vegetable yield over a period of 1986-2012 (k) Relationship between temperature and oil palm yield (l) Relationship between rainfall and rice yield (m) Relationship between temperature and rice yield (n) Relationship between rainfall and maize yield (o) Relationship between temperature and maize yield. Table 1: Regression equations between rainfall and crop yields over 1986-2012. Table 2: Regression equations between temperature and crop yields over a period of 1986-2012. Trends in time course of production figures of the crops evaluated are presented in Figure 6. The time series of the yields of these crops over a period between 1960-2012 were described by regression equations (Figure 6). Similar to the trends obtained for rainfall and crop yields, the relationship between temperature crop yields were weak. This is characterized by the low R2 values ranging between 0.05 and 0.17. The R2 for cassava, oil palm, yam, cocoa and plantain tended to be consistently high also R2 for temperature that a few number of the crops respond positively to temperature increments. Temperature increases is not a favourable condition for the crop yield except for okra, plantain and oil palms which sows positive correlations between their respective yields and temperatures. Figure 6: Relationships between some weather factors (rainfall, maximum temperature) and yields of some crops (a) Time series of plantain yield over period of 1986-2012 (b) Time series of vegetable yield over period of 1986-2012 (c) Time series of yam yield over a period of 1986- 2012 (d) Time series of cassava yield over a period of 1986-2012 (e) Time series of maize yield over period of 1986-2012 (f) Time series of rice yield over period of 1986-2012. This paper examined the association of variability in climate factors with yields of some major staple and cash crops in Nigeria. The selected crops occupy prominent position in the nation’s agricultural transformation agenda. The variable decadal trends portray variabilities in weather conditions during the period of study. The changes appear to have profound and negative impacts on agricultural crops considered. Possible adaptation measures to reduce climate change effects include development of irrigation infrastructure, flood control development of crop varieties that are resistant to weather extremes. An innovative way out of the problem is to incorporate weather index insurance in agriculture into the National Agricultural Insurance Scheme (NAIC) (Ajetomobi 2016). Needed is a concerted effort to move towards a weather-based insurance scheme for example, the Weather Index Insurance for Agriculture (WIIA). Although crop insurance exists in Nigeria, it covers less than 1% of the total population of farmers. This study assessed time course of climate impacts on yields, and the areas and crops where attention should be focused. There is still very limited climate impact evidence despite the importance of the selected major crops to agricultural production (food and income) in Nigeria. The study provided information and improved insights about trends of past crop productivity and historical weather data for major arable (cereal and legume) and cash permanent crops. The findings are applicable to the development of strategies to close productivity gap between actual and potential yields to meet rising food demand in the premise of the changing climate. Adaptation strategies and climate-smart, climate-resilience approaches to alleviate impact of extreme weather of agriculture such as development of irrigation and other infrastructure, flood control and improvement in crop varieties that are resistant to weather extremes are recommended for adoption. It is also important to develop crop varieties that are resistant to severe weather conditions such as high temperature, low and variable rainfall and humidity. Accurate weather information is necessary to characterize the trend of increasing variability of rainfall, temperature and extremity of other weather factors. This information would be useful in the prevention or amelioration of weather-related disasters through early warning system, education and effective response/adaptation systems. It is therefore recommended that adequate forecasting should be done on daily, weekly, monthly and on yearly basis and must be done early enough to guide the farmers in carrying out their farming activities in order to obtain high crop yields in addition to the prevention of weather-related disasters through early warning system, education and effective response/adaptation system. The government of Nigeria should take steps at ensuring that establishment of well-equipped weather stations as against the backdrop of few but non-functional and ill-equipped ones. The yield change uncertainty is the case for large parts of Africa may be due to the lack of robust data. This study addressed some aspects of the research gap by providing relationships between climate and crop productivity in Nigeria, a food insecure region. More studies to provide evidence for informing governments, for decision making, and international organizations and in guiding international policy makers and research agendas. It is recommended that research effort is devoted towards identifying appropriate adaptation options and responses, for Africa (at least in the short to medium term), it is important that the evidence base on climate change impact on crop productivity continues in earnest. Intergovernmental Panel on Climate Change (IPCC). Climate Change: The Physical Science Basis. Contribution of Working Group 1 to the Fifth Assessment Report of the Intergovernmental Panel on Climate Change, Cambridge University Press, Cambridge, UK. 2013. CCAFS 2009 Climate Change, Agriculture and Food Security. A CGIAR Challenge Program (Report No. 1) (Rome and Paris: The Alliance of the CGIAR Centre and ESSP). Lobell DB, Burke MB, Tebaldi C, et al. Prioritizing climate change adaptation needs for food security in 2030. Science. 2008;319:607-610. Rosenzweig C and Parry M. Potential impact of climate change on world food supply In: Tietenberg T (Ed.) The Economics of Climate Change, Cheltenham, UK: Elgar : 1997;118-136. Agele SO, Iremiren GO, Aiyelari OP, et al. Mainstreaming adaptation, resilience and disaster risk reduction into extension of frontiers of cacao to marginal soils and climate of the humid tropics in the wake of climate and weather variabilities. 11th Annual International Symposium on Environment, Athens, Greece. Athens Institute for Education and Research. 2016. Food and Agriculture Organization of the United Nations Cropping Database. FAOSTAT 2012. Crop Statistics for Africa and South Asia. FAOSTAT 2010. Knox J, Hess T, Daccache A. et al. Climate change impacts on crop productivity in Africa and South Asia. Environ Res Lett. 2012;7:034032. Roudier P, Sultan B, Quirion P et al. The impact of future climate change on West African crop yields: What does the recent literature say? Global Environ. Change. 2011;21:1073–1083. Lobell DB, Celine B, Duffy PB. Climate change uncertainty for daily minimum and maximum temperatures: a model comparison. Geophys Res Lett. 2007;34:1-5. Muller C, Cramer W, Hare W L et al. Climate change risks for African agriculture Proc Natl Acad Sci U S A. 2011;108:4313-4315. Ajetomobi JO. Effects of weather extremes on crop yields in Nigeria. African J. of food, agriculture, nutrition and development 2016;16:11168-11184. Kurukulasuriya P, Mendelsohn R. How will climate change shift agro-ecological zones and impact African agriculture? The World Bank Development Research Group. 2008. Challinor A, Wheeler T, Garforth C, et al. Assessing the vulnerability of food crop systems in Africa to climate change. Clim Change. 2007; 83:381-99. Semenov MA, Mitchell RA, Whitmore AP, et al. Shortcomings in Wheat Yield Predictions. Nature Clim Change. 2012;2:380-382. Mosammam HM, Mosammam AM, Sarrafi M, et al. Analyzing the potential impacts of climate change on rainfed wheat production in Hamedan Province, Iran, via generalized additive models. J Water Clim change. 2016;7:212-223. Mendelsohn R. The Impact of Climate Change on Agriculture in Developing Countries. J Natu Resou Policy Res. 2009;1:5-19. Luo Q. Temperature thresholds and crop production: A review. Clim Change. 2011;109:583-598.